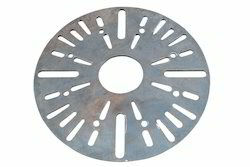 Hi-defnition CNC plasma cutting up to 100mm thick MS/SS/ALUMINUM cutting services in Chennai. 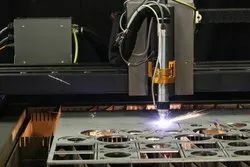 Counted as one of the prominent service providers, we are involved in offering a flexible CNC PLASMA - SS Cutting Services UP TO 100MM THICKNESS. The entire services are rendered by our expert engineers having rich industrial experience. .
Enriched with vast industrial experience, we have been able to offer an exclusive SS Plate Cutting Services. Our services are widely preferred by most of the clients owing to promptness and consistency. We utilize best available technologies and strictly follow international industrial standards for SS plate cutting and ensure accuracy and perfection. Our services are acknowledged for reliability and timely execution. 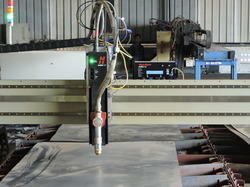 New Advanced CNC Plasma cutting Machine in Chennai. We have started production in our New CNC Plasma cutting Machine . 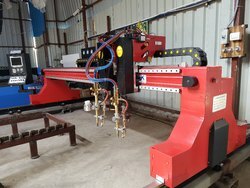 In Tamilnadu this is a first CNC Plasma cutting machine with all features in Job shop Industry. 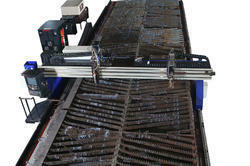 Machine size: 4500 x 16000- True hole enabled with HYPERTHERM MAKE HPR400XD Mechanized Plasma CUTTING system. 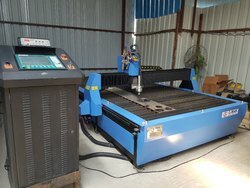 This is a new advanced technology of CNC Plasma cutting equipment with Hi-definition, Hyperformance, Longlife Plasma system. Hypertherm make Edge Pro CNC , HPR 400 XD ( 400 AMPS) CNC Plasma Power source with Automatic Gas console & Arc Glide Height control with latest Pro Nest 2015 Auto Nesting CNC Programming software. The above combination ensures High quality of cutting with less Tapper & more Accuracy , smooth finish & True Circle Holes like CNC Laser cutting. Due to dross free cutting up to 38mm, we can avoid deburring work which saves more Man power & Electric Power Cost. Ensures fastest delivery. We can cut any metals like Mild steel ( MS), Stainless Steel ( SS) & Aluminium up to 100 mm thickness. piercing up to 75mm Thick SS. 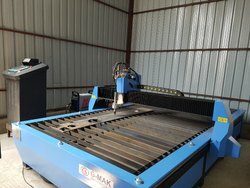 Established in the year 2010, Gk Profiles, is known to be one of the leading providers of this highly praised and commendable range of CNC Plasma & CNC Laser Cutting Services & we are undertaking medium engineering Fabrication. Along with this we manufacture the finest Machined Components. The range made available by us in the market, is made up of the finest Manufacturing & Selling CNC Laser , Profile & Plasma cutting components, CNC Plasma Cutting up to 90 mm thick SS, Alu & MS plates, having a high demand in the market. The range for reasons of quality maintenance, is provided to clients as per the set industry norms and guidelines, utilizing the finest resources. 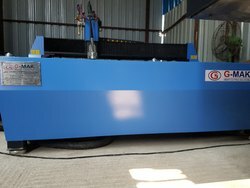 Very good choice for flame and plasma cutting & suitable for large scale industry & JOB SHOP where high volume of cutting requiredIt is specially designed for metal plate cutting process.Machine size can be produce due to customer's requirement on X and Y direction.Strong gantry system ensures durability, stability and quick speed1. Both driving end and cross beams adopt box-beam welding structure, it features compact structure, light weight, good rigidity, small deformation and artistic appearance.2. The driving of the main longitudinal end beam and moving of transverse torch adopts Japan Panasonic AC servo driver and motor which drives Gearbox reducer through rack-and-pinion gearing. 3. The side of driving end beam equipped with horizontal guiding wheels which can make the guiding wheel press rail tightly by adjusting its eccentric shaft, therefore, the stability and accuracy during the whole moving can be assured.4. The longitudinal guide rails are all made by high intensity track, all the contact surfaces of track have precision machining and accurate grinding racks are installed outside the guide way.5. 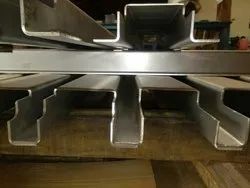 The longitudinal guide rails are firmed by pressing plate backing board and connecting sleeve, which can ensure the longitudinal straightness and parallelism of rail.6. Automatic igniter and height controller of torch can be chosen according to customer's requirement, with convenient operation. The finest range of CNC Plasma Cutting Services UP TO 100 MM THICKNESs SS, ALuminium & MS Plates , made available by us in the market, is widely praised and preferred in the market. With very high precision for cutting SS, MS and other metals.Light design of the beam promises high cutting speed and accuracy. Looking for CNC Plasma Cutting Services up to 100 mm thick SS & Alumimium ?